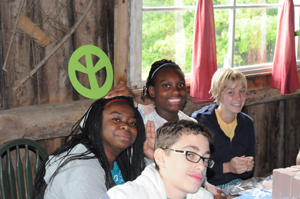 The Growing Peace Project is a program of Milestone Adventures, Inc, a 501(c)3 non-profit corporation. We are located in the hills of Vermont. To contact us please send an email to Jacqueline at thegrowingpeaceproject@gmail.com. What’s our goal? To empower youth to become “bridge builders,” bringing together a diverse mix of interests to build community and to grow peace. Although students identify and tackle their own community issues, one theme that we routinely address is food insecurity. We consider the question, “Can there be peace in the world if people are hungry?” We grow a free food garden dedicated to serving local community members in need. 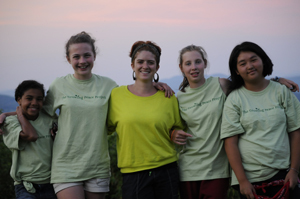 Summer retreat students maintain and harvest the garden, deliver produce, or prepare meals for the needy. As the number of participants grows each year, follow up retreats and an online presence enable student activists to continue networking and sharing resources. What we need: The program is entirely free for schools to participate, yet for the past 5 years we have been operating on a shoe-string budget through community donations. We need your support to maintain our existing programs and to build capacity for growth – to expand the garden, offer staff stipends, outreach to more schools, develop curriculum, go global! 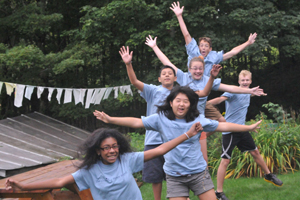 Please join us in bringing kids together in peace, collaboration, and service. Our work is based on the premise that peace in the world can only be achieved through building friendships across cultures and working together to address social issues. Your support will help further the skills of our student leaders and activists, as they positively impact their spheres of influence and help to effect change in the larger community.